Friends gather in the Rainbow Room of the Cosgriff Hotel at some unknown date and for some unknown occasion. Keith Gillam of Craig was the photographer. The local Craig restaurants are often favorite places for clubs and other groups to gather to celebrate or just enjoy a meal after some activity. The photo shown here was taken in the old Rainbow Room of the Cosgriff Hotel which was located at 110 East Victory Way. The Cosgriff, built in 1939, was a swank establishment during the first 30 years of its existence. As financial stresses took a toll on the building and management policies, locals still continued to frequent its dining rooms on a regular basis. Up into the 1970s, the restaurant continued in a tradition of elegant buffets, complete with ornate ice sculptures and a tremendous variety of dishes to choose from. 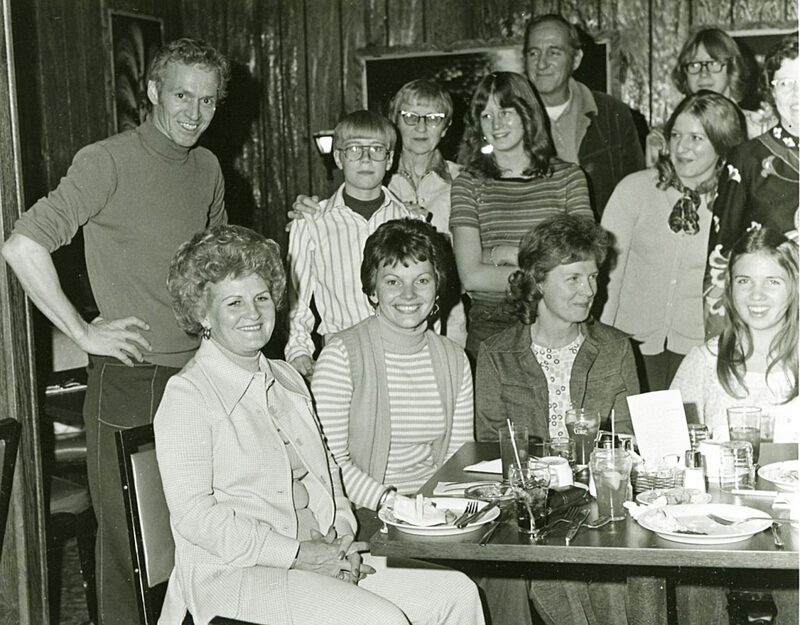 This photo, taken by local photographer Keith Gillam in the mid to late 1970s, shows a gathering of friends who have obviously just finished up a meal. The only two people identified are Jean Moore and Karen Moore who are seated third and fourth from left. If anyone can identify the other people in this photo, and possibly know what the occasion was, the staff at the Museum of Northwest Colorado would love to get a phone call at 970-824-6360.